Now that the main part of the racing season is done training has taken a back seat for a moment and the month of July was all about enjoying the true nature of cycling! 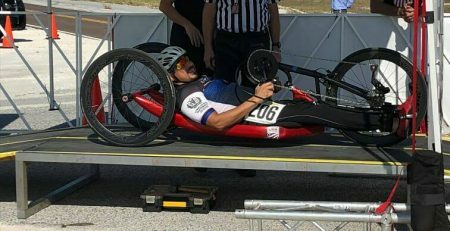 I love to travel and ride my handcycle in the most beautiful places, namely the mountains and beaches of California, so that’s exactly what I’ve been doing as much as I can so far this summer!! First trip of July was to Big Bear for a day where I rode around part of Big Bear Lake and up to Baldwin lake, taking in the Sapphire blue waters lined with pines and traversing through dusty meadows tucked away in the hills just to the north. The second trip was a bit longer and this time at the Ventura coast to celebrate the 4th of July. I rode twice during that trip, on 4th of July from Ventura to Santa Barbara which was an all day affair but so awesome to enjoy the fanfare of Independence Day over 68 stunning coastal miles, also marking my longest ride of 2018!! Whooo! The following day I rode from Ventura inland to Ojai for a yummy burrito and an ice cream cone! It doesn’t get any more summer than that!! Before arriving in Mammoth we made our traditional stop at Schat’s Bakery in Bishop for scrumptious milk chocolate macaroons and sandwiches from the deli to fuel our hunger worked up on the long drive. We got to Mammoth in the early afternoon and set up camp, eagerly awaiting the rides we had planned to embark on. Over the next three days in Mammoth I rode 112 miles and climbed 6,700ft, covering the Mammoth Scenic Loop, Convict Lake, Owens River Valley, June Lake Loop and up to Lee Vining, and the Mammoth Lake Basin Bike Trail which takes you to Twin Lakes, Lake Mary and Horseshoe Lake!! There were some serious challenges during a couple of these rides but Jeff and I remained calm, had faith, persevered and managed to solve our problems with the aid of many prayers and helpful friends! Bidding farewell to Mammoth we traveled further up to North Lake Tahoe for four more days of epic cycling, a dinner cruise on the lake, and whatever else we may happen upon! Starting off our stay in Tahoe I rode from Silver Creek Campground in Truckee to Kings Beach for a French Toast breakfast delight, making for a lighthearted 34 miles of smiles and plenty of good vibes. Today is the last day of July and I made it EPIC with a challenging 50 mile ride through Tahoe City, Kings Beach, Truckee, Donner Pass and around Donner Lake! Hope everyone out there is having a great July and summer, let’s live it up by having tons of FUN!! !